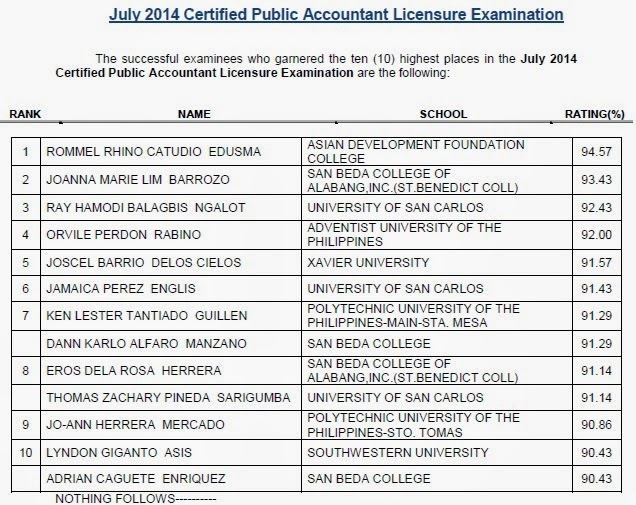 The Professional Regulation Commission (PRC) released on Friday, August 1, 2014 the complete results of July 2014 Certified Public Accountant (CPA) licensure exam. Rommel Rhino Catudio Edusma, graduate of Asian Development Foundation College (ADFC) topped the board with 94.57 percent grade. A University of San Carlos (USC) graduate Ray Hamodi Balagbis Ngalot grabbed third spot with 92.43 percent grade.